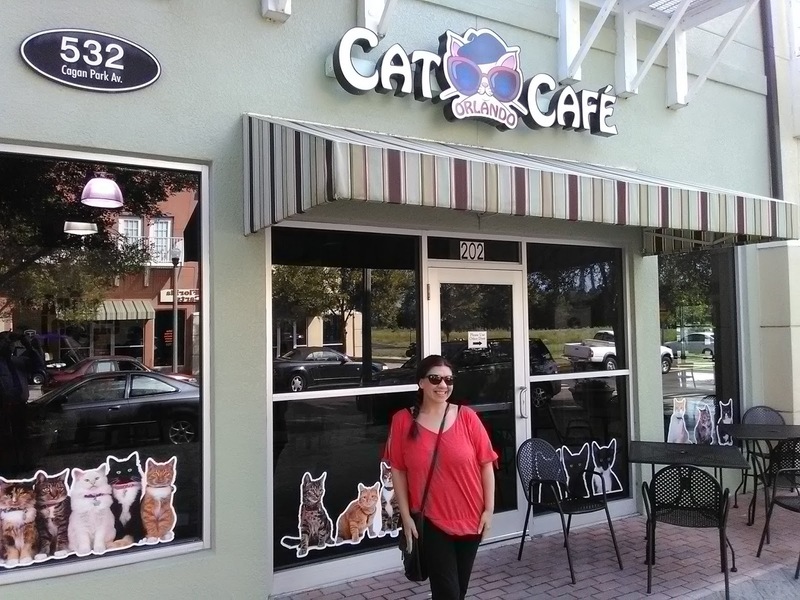 We first discovered Orlando Cat Cafe in January, while it was still in the early phases of development. This week, we stopped by to see the results of the completed project - Orlando Cat Cafe is officially open fur business, right meow. (I know... cat puns are cheesy, but in a situation like this, I can hardly resist.) This place is every bit as paw-some as we dreamed it would be. 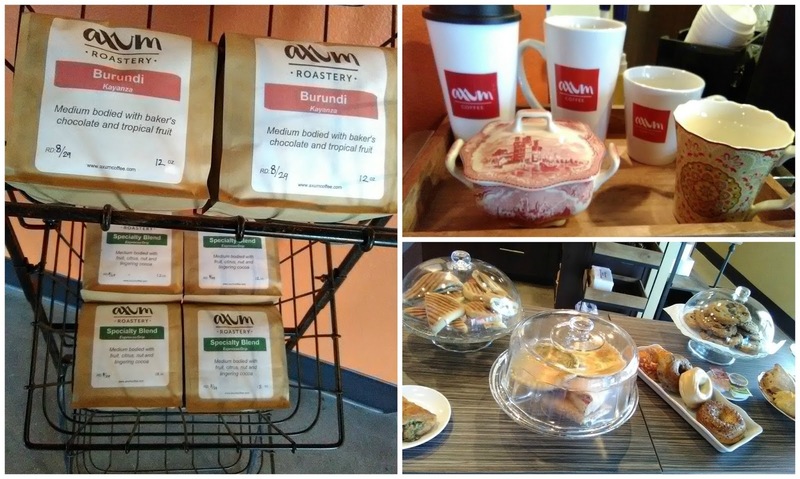 In the cafe area, Axum Coffee Shop offers an assortment of hot and cold beverages and snacks. 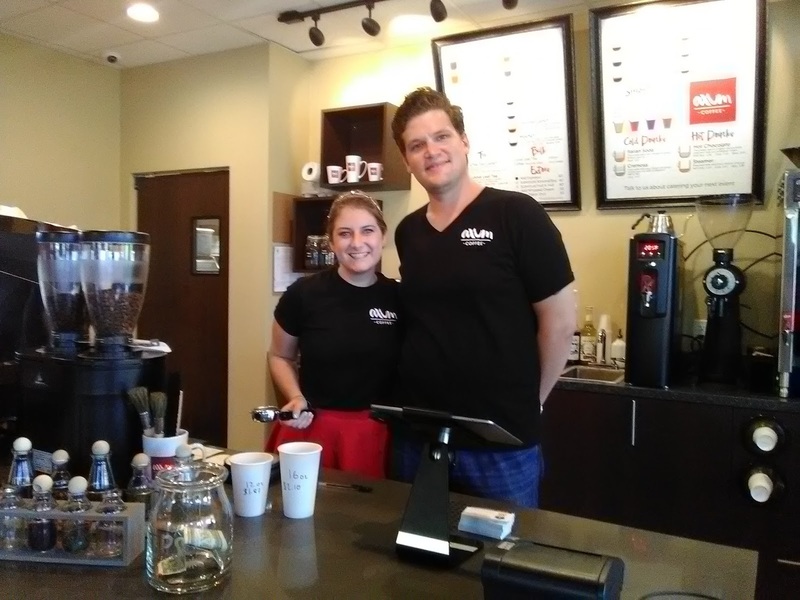 The coffee is exceptional, and a better value than trendy competitors. 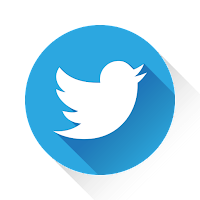 Most importantly, Axum has a reputation for friendly staff providing excellent customer service. 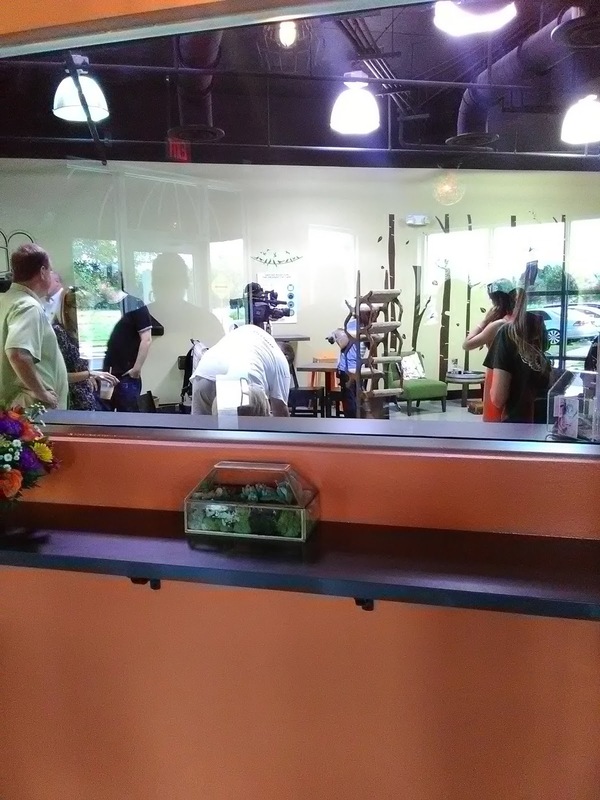 From the cafe, guests can spend some time observing the cats within the Cat Play Area. There are two doors entering into the Cat Play Area from the cafe. 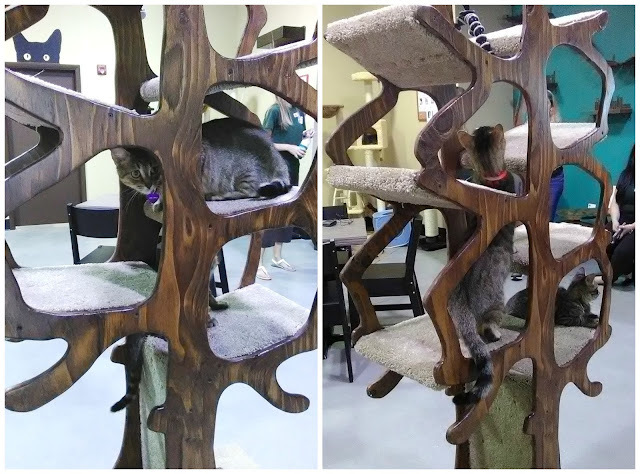 Even if you have allergies or are a bit leery about being in a room full of free-roaming cats, who doesn't love observing their antics? 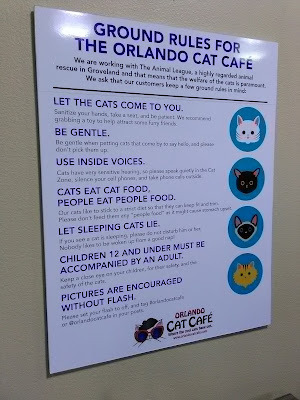 Prior to entering the Cat Play Area, "ground rules" are posted for guests to take into consideration. 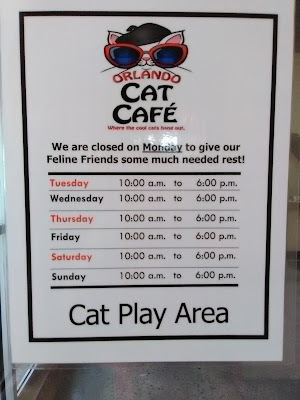 Essentially, it all boils down to - you are the guests here, and the cats rule the roost... be respectful and considerate. 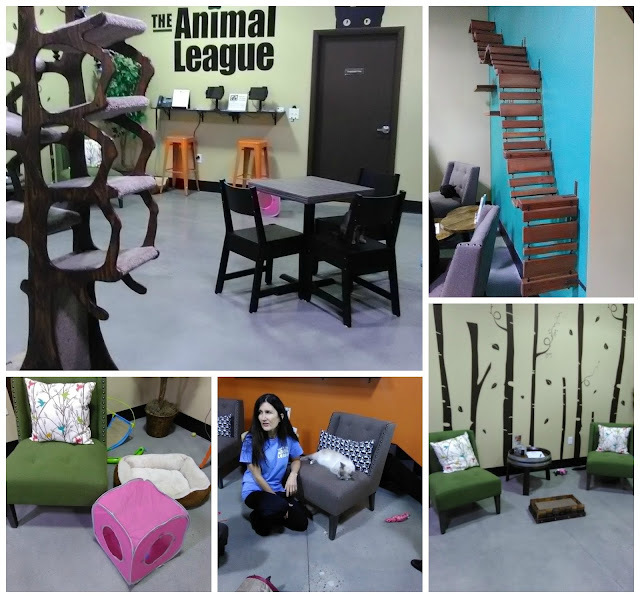 The Cat Play Area offers plenty of seating options for visitors, with an ample supply of cat-friendly features intermingled throughout the room. Resident cats (of which there will be 12-15 at any given time) have numerous options for play and rest - as well as a cats-only exit door, providing the cats access to a guest-free zone when they need a break from interaction. 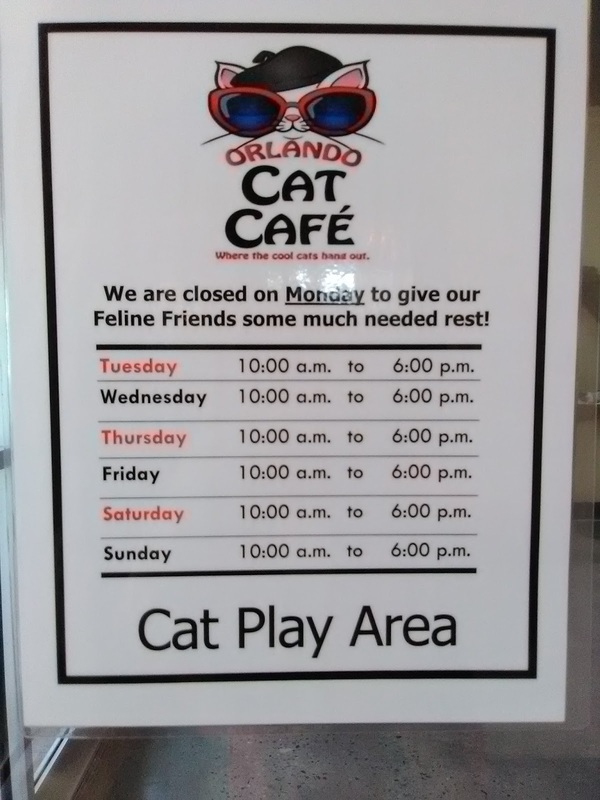 All of the cats at Orlando Cat Cafe are carefully selected by the South Lake Animal League for inclusion in residency. 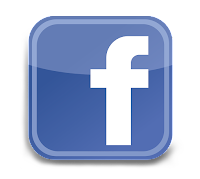 They represent a wide variety of ages, breeds, and types, while all exhibiting a pleasant demeanor and friendly temperament in interaction with both people and other cats. 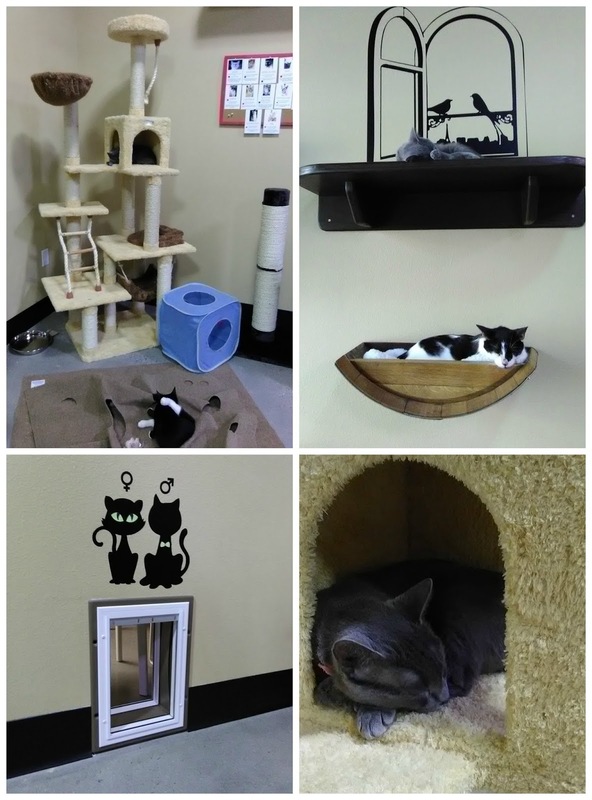 We observed plenty cat naps in progress, but there was also a lot of play going on. 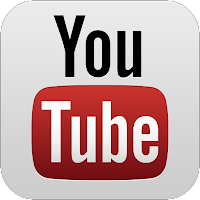 If you're a cat lover, this is a prime opportunity to enjoy cat-tastic behaviors, and maybe even record a future YouTube viral video! 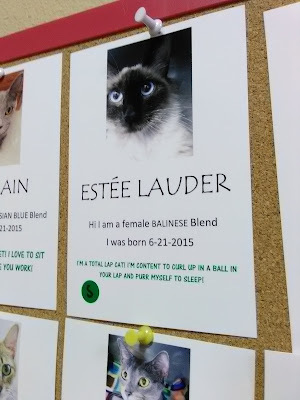 Personally, I fell in love with Estee Lauder, a beautiful and spunky female Balinese. 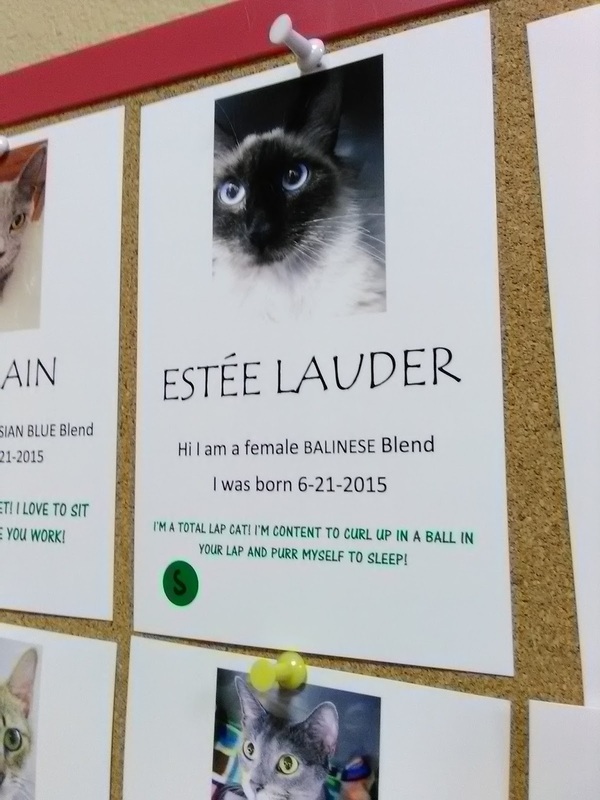 I learned a little bit about her on a corkboard in the play area. 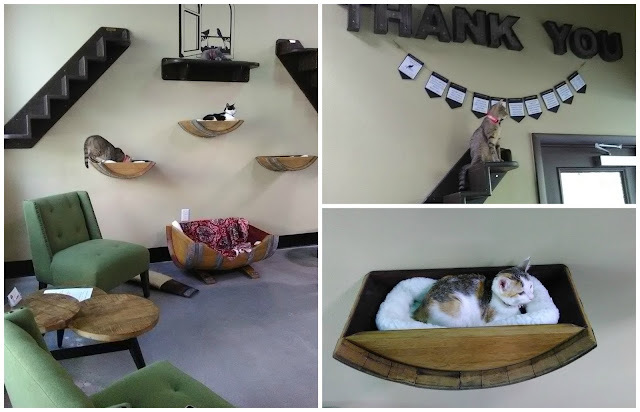 Each of the cats at Orlando Cat Cafe are looking for homes, so they ARE adoptable! The play area is staffed by South Lake Animal League volunteers, and they are happy to help you navigate the adoption process when you find that forever feline friend to call your own. 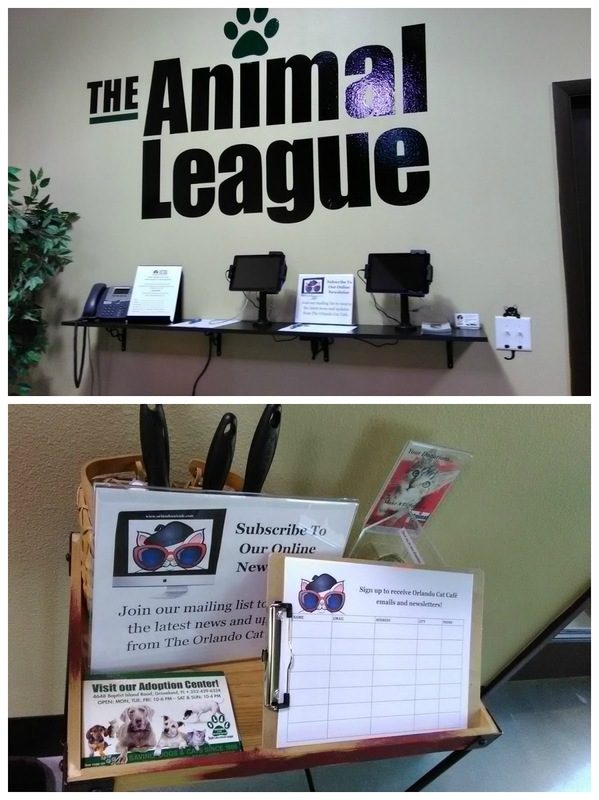 The play area is equipped with stations for visitors to sign up for newsletters and additional information. Hand sanitizer and lint brushes are also made available for guests. 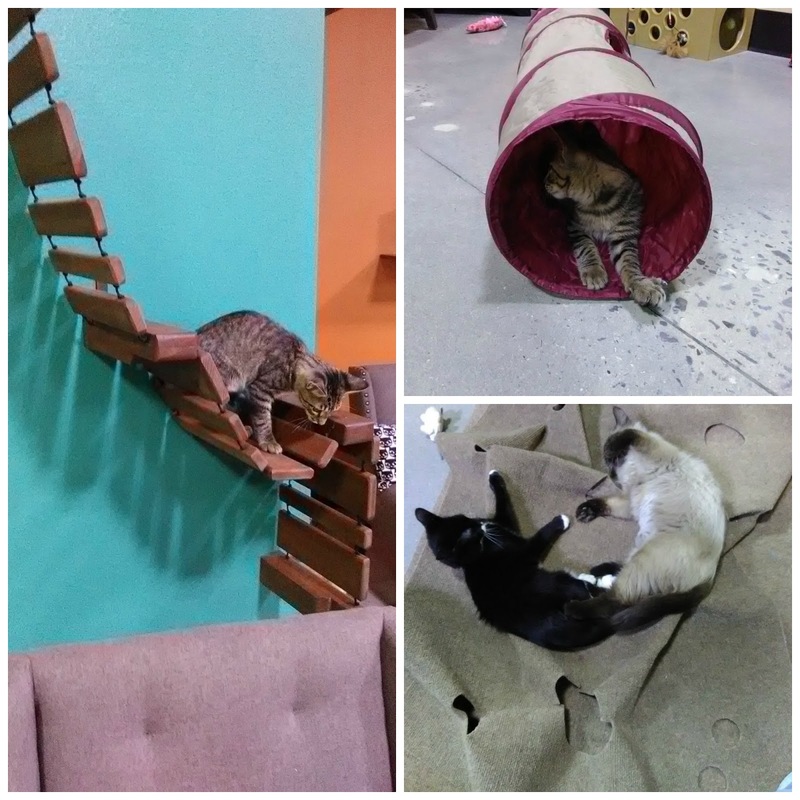 Since the play area is staffed by a volunteer rescue center, donation boxes are placed in a few locations. These funds go directly toward the care of South Lake Animal League's residents and day-to-day operation, as do the funds from guest admissions and adoptions (which run from $25 - $125, and are based on "best match" rather than first come, first placed). 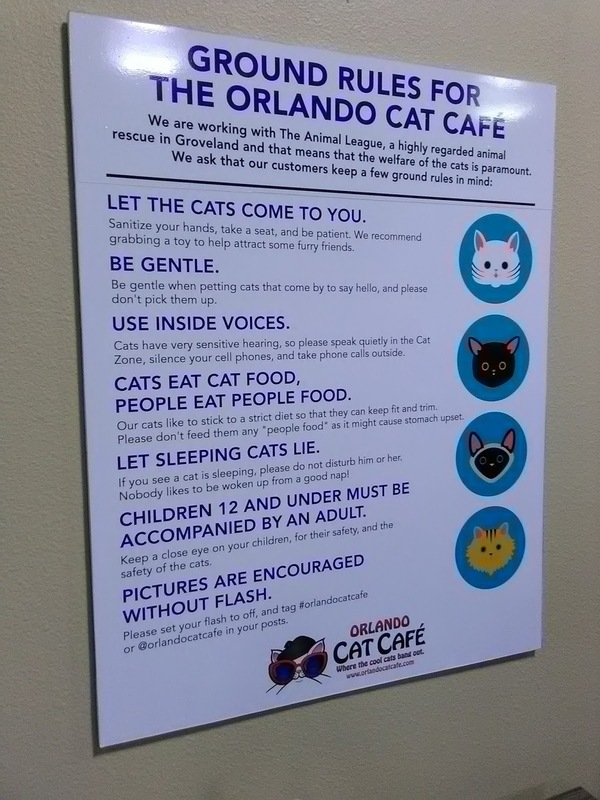 Orlando Cat Cafe will offer scheduled, themed events beyond the standard visits ($8) and private bookings ($50). Weekly sessions offering "coloring with cats" ($10) and "yoga with cats" ($15) are already on the calendar, with "reading with cats" coming soon. Book your visit at least 24 hours in advance to guarantee a reserved spot.